Papua New Guinea appears to have been settled by 14,000 BC , with migrations first of hunters and later of agriculturists probably coming from the Asian mainland by way of Indonesia. Early communities had little contact with each other because of rough terrain and so maintained their autonomy, as well as their distinct languages and customs. LOCATION: 140°51′ to 160° E ; 0° to 12° S. BOUNDARY LENGTHS: Total coastline, 5,152 kilometers (3,202 miles); Indonesia, 820 kilometers (509 miles). TERRITORIAL SEA LIMIT: 12 miles. 1850s, and the Germans sought coconut oil available in northern New Guinea about that time. The Dutch and the British had earlier agreed on a division of their interests in the island, and from 1828, the Dutch began to colonize the western portion. Although the British flag was hoisted on various parts of eastern New Guinea, the British government did not ratify annexation. Some Australian colonists were eager to see New Guinea become a British possession, for trade, labor, gold mining, and missionary reasons. However, it was not until 1884, after an abortive Australian annexation attempt and under fear of German ambitions in the area, that Britain established a protectorate over the southern coast of New Guinea and adjacent islands. The Germans followed by laying claim to three different parts of northern New Guinea. British and German spheres of influence were delineated by the Anglo-German Agreement of 1885. Germany took control of the northeastern portion of the island, as well as New Britain, New Ireland, and Bougainville, while Britain took possession of the southern portion and the adjacent islands. British New Guinea passed to Australian control in 1902 and was renamed the Territory of Papua in 1906. German New Guinea remained intact until the outbreak of war in 1914, when Australian forces seized it. Although the territories retained their separate identities and status, they were administered jointly by Australia from headquarters at Port Moresby. In 1921, the former German New Guinea was placed under a League of Nations mandate administered by Australia; in 1947, it became the Trust Territory of New Guinea, still administered by Australia but now subject to the surveillance of the UN Trusteeship Council. 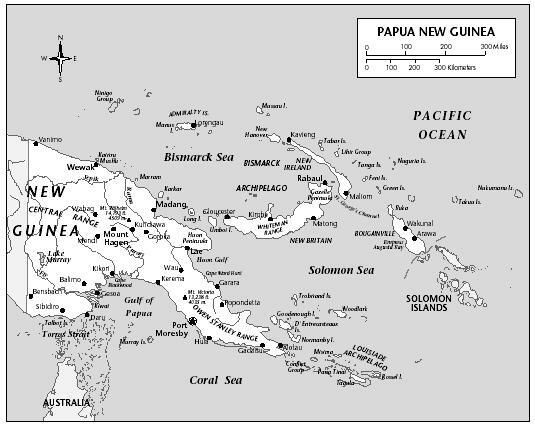 Both territories were merged into the Territory of Papua and New Guinea in 1949. A Legislative Council, established in 1953, was replaced by the House of Assembly in 1964. Eight years later, the territory was renamed Papua New Guinea, and on 1 December 1973, it was granted self-government. Separatist movements in Papua in 1973 and secessionist activities on the island of Bougainville in 1975 flared briefly and then subsided, though debates over citizenship and land-reform provisions were vigorous until the passage of a constitution in 1975. Papua New Guinea achieved complete independence on 16 September 1975, with Michael Somare as prime minister of a coalition government. Somare was voted out of office in 1980 but reelected in 1982; subsequently, he put through a constitutional change giving the central government increased authority over the provincial governments. Soon after, he suspended three provincial administrations for financial mismanagement. Somare also had to contend with social unrest, which culminated in June 1985 in a state of emergency after a prolonged wave of violent crime in Port Moresby. At the same time, his Pangu Pati was split by his deputy, Paias Wingti, who then founded a new party, the People's Democratic Movement (PDM). In November 1985, Somare was again voted out of office on a no confidence motion, and Wingti formed a cabinet. Though unrest continued, with serious riots in the Highlands in 1986, elections in mid-1987 returned Wingti to office at the head of a shaky five-party coalition. Wingti's government was defeated in a no confidence vote in July 1988; a coalition government led by Rabbie Namaliu replaced the PDM government. A secessionist crisis on Bougainville dominated domestic politics during 1990–91. The Bougainville Revolutionary Army (BRA) declared the island of Bougainville to be independent from Papua New Guinea in May 1990, and in response government forces landed on the north of Bougainville in April 1991. Namaliu adjourned parliament early in 1991 to avoid a vote of no confidence over the Bougainville crisis. Paias Wingti, the leader of the People's Democratic Movement (PDM), was reelected prime minister in July 1992 as the leader of a new coalition government with the support of the People's Progress Party, and the League for National Advancement. During 1993 the government continued to extend its control over Bougainville, partly because of popular revulsion against human rights violations by members of the BRA. In September 1994, rebel troops withdrew to the surrounding hills of the Bougainville copper mine allowing government forces to reclaim it. In 1995, the prime minister halted cease-fire talks. In 1997, reformist premier Bill Skate, governor of Port Moresby, was elected by members of PNG's 109-seat parliament defeating Michael Somare who was also defeated for the post of parliamentary speaker by John Pundari who is a member of Pangu. Skate represented Julius Chan who lost his seat in the elections but who supported Skate's selection as premier. Chan had hired a group of mercenaries to put down the rebellion in Bougainville, angering Brigadier General Jerry Sinigirok. Chan dismissed Sinigirok; a decision that led to rioting by 2,000 Sinigirok loyalists. Ultimately Chan made the decision to step aside pending a judicial inquiry into the hiring of mercenaries. Chan had been elected prime minister on 30 August 1994. Resolution to the Bougainville problem remained elusive until the government of Bill Skate reached a truce with the rebels in 1998. In April 1998, a permanent cease-fire agreement was signed and the reconstruction of war-torn Bougainville commenced. Up to 20,000 people had been killed during 9 years of conflict. In 1999, the rebel leaders and the PNG government signed an agreement known as the Matakana and Okataina Understanding which established an agreement to continue discussions about the island's political future. In August 2001, the Bougainville Peace Agreement was signed, which would provide for an autonomous Bougainville government and secure a plan of disarmament. A referendum on independence would be conducted in 10 to 15 years' time. Throughout the 1990s, crime increased in PNG, especially in the capital of Port Moresby, leading to a dusk-to-dawn curfew and a ban on the sale of alcohol in 1997. In July 1999, Bill Skate resigned as prime minister as allegations regarding the misappropriation of development funds arose. On 14 July 1999, the national assembly chose Sir Mekere Morauta as prime minister in a 99 to 5 vote. Morauta sought to restore damaged relations with the People's Republic of China, which was angered by the Skate government's decision to accept normal relations with Taiwan in return for economic assistance. The Morauta government engaged in a privatization program, and successfully negotiated with the IMF and World Bank for an aid package in 2000. On 14 March 2001, hundreds of soldiers led a mutiny against Morauta's government in protest of a proposed defense force restructuring plan. They seized an armory, and only relinquished their weapons a week later when Morauta promised a full amnesty for the soldiers involved in the revolt and a withdrawal of the controversial military restructuring plan. Former Prime Minister Michael Somare became prime minister once again on 5 August 2002 when his National Alliance won the parliamentary elections in June that year. The elections were marked by violence and widespread irregularities, including vote-rigging. Somare was elected unopposed by a vote of 88 to 0, with members from Morauta's People's Democratic Movement and a section of the Pangu Party abstaining. Somare immediately set out to halt Morauta's privatization program, stating that the government would need more time to assess state assets. Somare headed a coalition of 13 parties and 20 independent members of parliament. He named a 28-member cabinet, including 19 new members of parliament. I have many questions. Here is a list of them. 1. When did crime become a problem? 2. What is the government doing to try to stop this problem? 3. What is the enployment rate? 4. Why is it so bad, that for tourists they have to have a personal security guide? 5. Is the police system good there? 6. What has the government tried to stop this problem? 7. What is PNG's jail system like? 8. How many people are sent to jail a month? 9. Are people motivated to get a job after they have lost their job/house? 10. Do the people not even try to get a job, or do they go out immediatly and start to commit crimes? 11. Is PNG's government strong enough to inforces better solutions? 12. What is security like around stores, homes, etc.? 13. How many people are caught? 14. What kind of people are making crimes? 15. To what extent does the government quit enforces the law? can you supply me with some information on this topic"colonization of PNG by early settlers"
Explain, what is global civics and send me more relative information and examples? Please, send a brief information about Colonization of PNG by early settlers. Please, send a brief expaination on the Sir Mekere's privatization policy. WHY did the Europeans colonize PNG, and what were the results?